I don’t think I can express in words how much I absolutely adore this sweater! I’m so excited for the release and I hope you all love it too. This sweater design is something that’s been rolling around in my head for a while. I often take inspiration from clothing I see and this time it was taken from my very own closet. Basically, it’s what I imagine it would look like if two of my favorite sweaters got together and had a beautiful baby. One sweater is a hoodie that I wear almost everyday (as long as it’s clean) even though it’s actually a maternity sweater. What I love about it is that it’s nice and long and has a wide trim. I think it hides my post baby belly quite well. Plus, it’s really comfortable. The other sweater is sporty fleece thing that has a playful cowl neck and drawstring. While I could see a beginner making with pattern without many issues, you do need to have some basic pattern reading skills. I have provided links to videos for almost every stitch or technique used though. If you’re a little more advanced you should had no trouble customizing some of the fit as well. 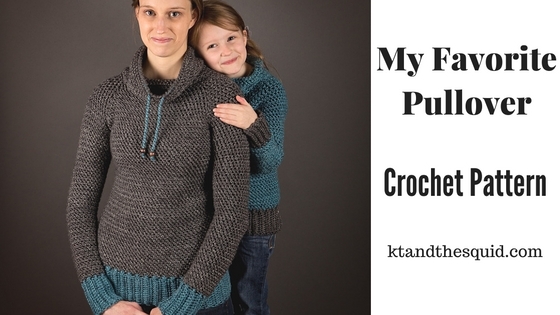 My Favorite Crochet Pullover is available in two different patterns. One for girls and one for women. While I did design it with girl’s in mind, I personally think it would be great for boys as well. The sweater is designed to have 2″ of ease. My bust is 34″ and I’m wearing size 32″ and the girl’s size is made in size 23″ with the models chest measuring 22″. If you’d like a looser or tighter fit you can easily go up or down a size. For my samples I used Lion Brand Heartland. I highly recommend this yarn. It’s absolutely perfect for this pattern. If you prefer Ravelry click HERE for the ebook (best value! ), click HERE for the girl’s pattern or HERE for the women’s pattern.